VYS Travel provides opportunities for players to participate in high quality, competitive soccer to help them reach personal goals and to develop as players to reach their full soccer potential. All our professional coaches work collectively via the VYS Coaching Philosophy and Style to provide players with the proper tools and instruction to enable them to foster technically, tactically, physically, and psychologically. Registration will be conducted online by visiting our Registration Page and selecting "Travel Tryouts"
What information is needed for registration? Is there any cost to register? No, tryout registration is FREE and open to all players. 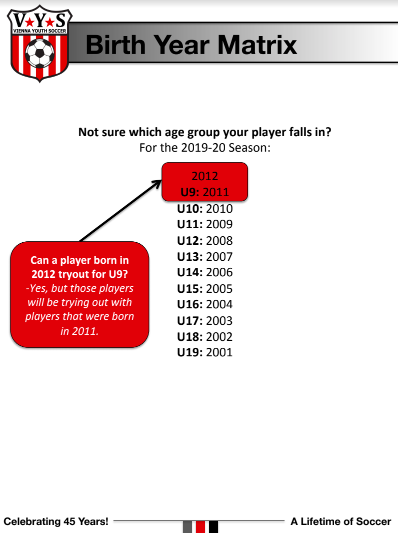 All players will need to register based on their current birth year. Players may be asked to tryout with the age group above based on coach and technical staff evaluations. Identified players will be informed prior to tryouts commencing. In case of rain or lightning, please check our website at www.vys.org to see if the tryout fields are open. Decisions will be made as early as possible and be notified through appropriate channels. After 3 pm, it will be the Tryout Director in consultation with VYS staff that make the decision whether to hold the tryout. Lightning: When lightning occurs, and is seen before or during a tryout, everyone must leave the field and go to their vehicles immediately. The tryout may resume after 30 minutes since the last lightning strike. It is the tryout Director in consultation with VYS staff to decide whether to continue or cancel the tryout after the 30 minutes. Notifications will be sent 48 hours after last tryout with flexibility to extend offers before that. Please note that if your tryout ends on a Friday, your 48-hour response period will begin on the Monday of the following week. To accept an offer, a player has 48 hours to respond and confirm acceptance. Players will be expected to respond via registration with paid deposit via the registration system. Deposits are non-refundable. Imagine being coached by eight different college coaches? And what if we told you they were coming here to Vienna? Learn more about The College Experience Event hosted by VYS. The VYS Travel Summer Camp Program is an opportunity for travel players to advance their technical ability and understanding of the game during the off-season. Great opportunity to prepare for pre-season play and tournaments! Read more. VYS is proud to offer goalies with opportunities to improve their skills and gameday performance. Open to all new and advanced travel goalies! Read more.